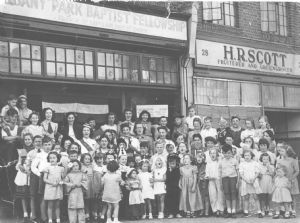 Albany Park Baptist Church was founded in 1941, during the second world war, as a church plant from Days Lane Baptist Church. This was to meet needs of a community that had started to grow rapidly in the 30s as a result of the new station at Albany Park, making the area an attractive part of commuter land. The church began in the front room of a house in Hurst Road. When numbers became too large the fellowship rented a vacant WHSmith shop close to the station (now Smarty Pants Dry Cleaners!). 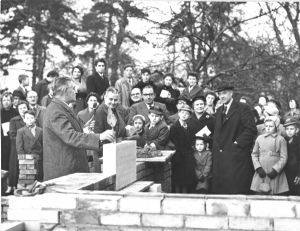 Eventually the Council made some land available as part of further development in the 1950s. The plan was for a church, a hall and a manse. The hall was built first as a multipurpose facility which most people now regard as the church. The land intended for the manse now has the hall and a car park. The land intended for the church is still empty but we dream that one day the original vision will be fulfilled. You can see more photos of the history of the church on our Facebook page.